This termination agreement allows the tenant to give up a portion of its premises to the landlord, and to convey personal property located in that space to the landlord. As a result, the landlord will be able to lease the space to a replacement tenant in an "as-is" condition. The tenant also must pay a termination payment to the landlord for the right to surrender the space. 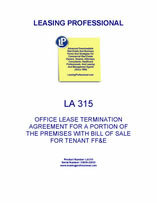 THIS PARTIAL LEASE TERMINATION AGREEMENT (the "Agreement") is made and entered into effective as of _____________________, by and between COMMERCIAL PROPERTY LANDLORD, LLC, a ______________ limited liability company ("Landlord"), and TENANT TECHNOLOGIES, INC., a ______________ corporation ("Tenant"). WHEREAS, Landlord is willing to cancel and terminate that portion of the Lease as it pertains to the Sixteenth Floor Space, upon the terms and conditions hereinafter set forth. (a) In consideration of Landlord's agreement below to cancel and terminate the Lease as it pertains to the Sixteenth Floor Space, Tenant has, simultaneously with its execution and delivery of this Agreement, (i) paid to Landlord the sum of _________________ Dollars ($__________) (the "Termination Fee") in certified funds or via wire transfer in accordance with wire transfer instructions provided by Landlord to Tenant; and (ii) relinquished any and all claims Tenant has or may have had with respect to and surrendered to Landlord the security deposit on account with Landlord in the amount of _______________ Dollars ($______). Subject to the payment of the Termination Fee and certain other conditions as set forth herein, Landlord and Tenant do hereby cancel and terminate the Lease as it pertains to the Sixteenth Floor Space effective as of 11:59 p.m. on ___________ (the "Effective Termination Date"). As of the Effective Termination Date, Tenant shall have leased the Fifteenth Floor Space only, and from and after said date, any reference to Premises in the Lease shall mean the Fifteenth Floor Space. (b) Upon the full and timely payment of the entire Termination Fee by Tenant and satisfaction of all of the other terms and conditions of this Agreement by Tenant, the Lease as it pertains to the Sixteenth Floor Space shall be canceled and terminated, and it is agreed that, except as specifically set forth in Section 4 of this Agreement, neither Landlord nor Tenant shall have any further rights, liabilities or obligations under the Lease as it pertains to the Sixteenth Floor Space from and after the Effective Termination Date; provided, however, nothing contained herein shall be construed as releasing Tenant from any and all obligations, liabilities and duties contained in the Lease as the same apply to the Fifteenth Floor Space. Landlord acknowledges that subsequent to the execution of this Agreement, it may determine that it has incurred a loss, damage or injury with respect to the Sixteenth Floor Space related to the releases herein given, but which were unknown or unanticipated at the time of execution of this Agreement, or that it may have had claim(s) or cause(s) of action which were unknown or unanticipated at the time of the execution of this Agreement, and Landlord hereby expressly agrees that, except as specifically set forth in Section 4 of this Agreement, the releases herein given shall apply to all such unknown, existing and unanticipated losses, damages, injuries, claims and causes of action related to the Sixteenth Floor Space. Effective as of the Effective Termination Date, Tenant acknowledges and agrees that Tenant's right to possession of the Sixteenth Floor Space has been validly terminated and Tenant has given, granted and surrendered, and by these presents does give, grant and surrender unto Landlord, its successors and assigns, the Sixteenth Floor Space and all the rights, usufruct, title and interest of the Tenant in and to the same. Effective immediately, Landlord shall have the unencumbered right, but not the obligation, to enter into a third party lease(s) with respect to the same or any portion thereof. 2. WARRANTY BILL OF SALE. Simultaneously with the execution of this Agreement, as additional consideration for Landlord's willingness to enter into this Agreement, Tenant shall execute and deliver to Landlord a warranty bill of sale in the form attached hereto as EXHIBIT "A" conveying to Landlord the furniture, fixtures and equipment presently located in the Sixteenth Floor Space ("Tenant's FF&E") as identified in the bill of sale. 3. RELEASE BY TENANT. Effective immediately, Tenant, on behalf of itself and on behalf of any other person or entity claiming through or under Tenant, does hereby release and forever discharge Landlord, its general partners and limited partners, and Landlord's and its partners' respective directors, officers, employees, shareholders, members, managers, agents, assigns, attorneys, successors, heirs, administrators, executors, representatives, and all others who may have acted or been claimed to have acted in concert with Landlord, who are liable or who might be claimed to be liable from any and all claims, charges, complaints, liabilities, obligations, promises, agreements, controversies, damages, demands, actions, causes of action or suits of any kind or nature whatsoever, whether they sound in law, equity, tort or contract which Tenant may have had, now has, or may have against Landlord or any such other persons or entities arising out of any act or omission of Landlord under that portion of the Lease as it pertains to the Sixteenth Floor Space or in any way connected with any and all transactions, occurrences, or other matters relating to that portion of the Lease as it pertains to the Sixteenth Floor Space. Tenant, on behalf of itself and on behalf of any other person or entity claiming through or under Tenant, does hereby further release and forever discharge Landlord and Landlord's successors and assigns from the return of any security deposit, commitment deposit or advance payment of rent paid to Landlord by Tenant at any time prior to the execution of this Agreement. Tenant acknowledges that subsequent to the execution of this Agreement, it may determine that it has incurred a loss, damage or injury related to the releases herein given, but which were unknown or unanticipated at the time of execution of this Agreement, or that it may have had claim(s) or cause(s) of action which were unknown or unanticipated at the time of the execution of this Agreement, and Tenant hereby expressly agrees that the releases herein given shall apply to all such unknown, existing and unanticipated losses, damages, injuries, claims and causes of action or other matters relating to the Lease as it pertains to the Sixteenth Floor Space.